The Gening D90 is a high speed and sensitive digital servo for helicopter and 3D airplanes (eg 3D EPP), including gyro operation. This fast, digital servo provides an extremely accurate neutral position. They are tailored for 3D fixed wing planes and micro electric helicopters and also display advantages in the field of industrial automation which needs accurate and high speed control. At T9 we have used them in 2M span ARF gliders too. A high fidelity MCU and excellent algorithm make it work smoothly and keep high frequency noise minimized. Gening use Frequency Conversion Technology which guarantees cooler operating temperatures during aggressive and prolonged 3D flight. 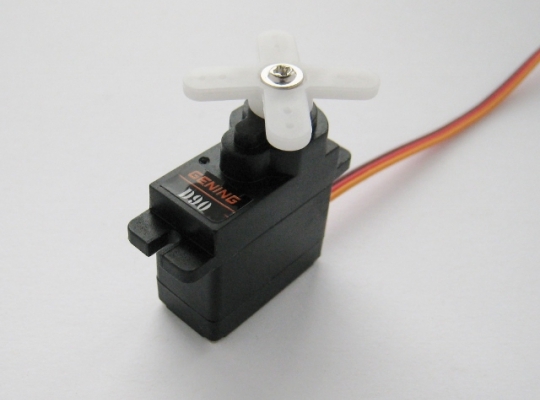 This advanced technology also provides lower power consumption and guarantees the durability of D90 Digital Servos. They demonstrate excellent performance as tail servos.